If you are looking for Precision Lab grade PH and Temp measurement then the Milwaukee Instruments Mi150-US is the meter for you. Milwaukee Instruments Mi150 pH/Temp Bench Meter, Martini. PH / Temperature Bench meter, Range: -2.00 to 16.00 pH,-20.0 to 120.0 C (-4.0 to 248.0F); accuracy of +/- 0.01 pH, +/-0.4C, automatic temperature compensation, automatic calibration in 1 or 2 points. 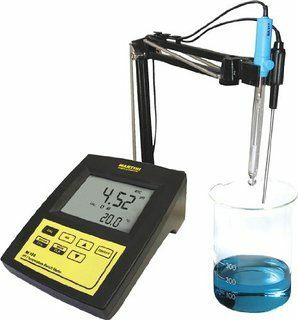 Supplied with Refillable pH glass electrode MA917B/1, temperature probe MA831R, 12 VDC Adapter, electrode holder MA9315, sachet calibration solution (1 each of M10004, M10007, M10010, M100016) and instruction manual. Stability Indicator prompts whenever reading stabilizes.